It is really easy to save emails to PDF or convert email attachments to PDF with the Mail Attachment Downloader PRO and Mail Attachment Downloader PRO Server. Under Actions, click Add action and choose Document conversion. This will add a new action in the list to the left. Click on the Document conversion list item under After saving file. You will see the conversions that are configured on the right side. Add a new document conversion by clicking the ‘Add conversion‘ button. Pick the source format (From Type) and the destination format (To Type). If you are using the PRO Server, then you can pick any format in the To. Otherwise, you will be limited to just PDF. Now each document attachment (doc, docx, txt, html, rtf, eml etc.) will be converted to PDF or TIFF or any To Type you selected above. If you want to also save the email body in addition to the attachments as PDF or TIFF, check the Save as .eml checkbox in the rule and the document conversion action (from Doc -> PDF or TIFF) will also convert the .eml file to PDF or TIFF. The .eml extension is considered a document for conversion purposes. If you want to convert other types such as cells (xlsx etc. ), slides (ppt etc.) or images (jpgs etc), you can repeat Step-3 to add the different From’s if you would like. This will save each attachment as a separate PDF or TIFF files. Further below we show how you can save emails and attachments as a single PDF. You can also save emails and attachments to a multi-page TIFF if required by following the same instructions except select tiff as the To type. 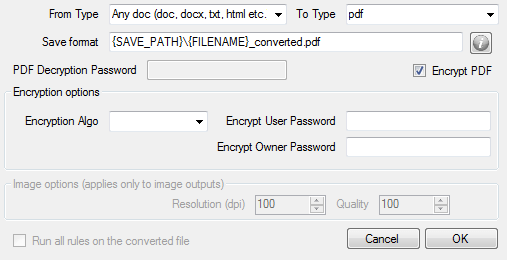 You may also choose to encrypt the PDF file by checking the ‘Encrypt PDF‘ checkbox if needed. Make sure Save as .eml is checked, this will save the email body. Ensure Document Conversion action is added and includes conversions from various types to PDF as shown below. Check the delete source files after conversion checkbox. The above will save the body and attachments all separately as PDF files. You can skip the next step if that’s all you want to do (save as separate files). To merge them into a single PDF: Right click on Document Conversion and then add Merge PDF files action. Check the delete all source PDFs checkbox. Now emails along with attachments will end up being a single PDF where the email is the first few pages and subsequent pages are the attachments rendered as PDFs. If you get the Mail Attachment Downloader PRO Server version, you can use it to convert emails (.eml or .msg or .txt or .html) and email attachments (text, html, word, excel, powerpoint and more) to over 50+ formats (bmp, csv, dif, doc, docm, docx, dot, dotm, dotx, emf, epub, excel, flatopc, flatopcmacroenabled, flatopctemplate, flatopctemplatemacroenabled, html, htmlfixed, jpeg, mhtml, mobixml, odp, ods, odt, openxps, ott, pdf, pdfnotes, png, potm, potx, pps, ppsm, ppsx, ppt, pptm, pptx, ps, rtf, spreadsheetml, svg, swf, tabdelimited, tex, text, tiff, tiffnotes, wordml, xamlfixed, xamlflow, xamlflowpack, xlam, xlsb, xlsm, xlsx, xltm, xltx, xml, xps)!